It's getting closer to the big day: Grand National 2018. 14th April 5:15 Aintree. Hope you have your betting slip ready because the Grand National 2018 Runners are limbering up to the challenge of four miles and two furlongs of highs and lows. That's just the fences. The names as famous as the race itself the Chair, Foinavon, Becher's Brook and even the Canal turn. Two circuits to have horse, jockey and punters chomping at the bit. It is a race which stops people in their tracks. So what are we to make of this year's race? Blaklion could well start favourite for this year's Grand National. Bookmakers have Nigel Twiston-Davies nine-year-old priced at 10/1. He finished fourth in the 2017 National so knows his way around this tricky course. So what could be his stumbling block? The fact that this bay gelding is 9lb higher in the weights which is a long haul over four miles. A leading chance. Total Recall is trained by top Irish handler Willie Mullins. The stable won the National back in 2005 when Hedgehunter prevailed. This nine-year-old son of Westerner is priced 10/1 with Ladbrokes. It's worth noting that just about anything can happen in the Grand National and why five 100/1 winners have made punters' days across the years. Another Irish raider is Tiger Roll. He didn't have much luck when pulling up in the Irish National. 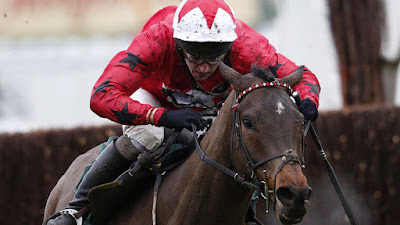 However, he proved his class when winning at Cheltenham in 2017. This eight-year-old is trained by Gordon Elliot. Definitely a horse who should stay the trip and holds each-way claims at 16/1. The Last Samuri is a horse who has had mixed fortunes in this race and a speculative price of 16/1. Kim Bailey's charge had a disaster when favourite in 2017. He was badly hampered and pulled up thereafter. It was a bad day for favoruite backers. Punters will be hoping he can show the form when finishing runner-up in 2016. He is still 10lb heavier than that big run which means he has to find something. Other leading contenders include: Minella Rocco. A real class horse who needs to come back to his best 16/1. Good luck with your selections. It pays to take the price rather than wait until the off as the odds generally shorten in the closing minutes. A quick rundown of the betting: Blaklion 10/1, Total Recall 10/1, Tiger Roll 16/1, Minella Rocco, The Last Samuri 16/1, Anibale Fly 16/1, Cause Of Causes 16/1, Bellshill 20/1, Gold Present, Rathvinden 25/1, Seeyouatmidnight 25/1, Vincente 25/1. 33/1 Bar.